Yamaha inverter generators have been a reliable and trusted brand of generators for a long time and their products never disappoint. 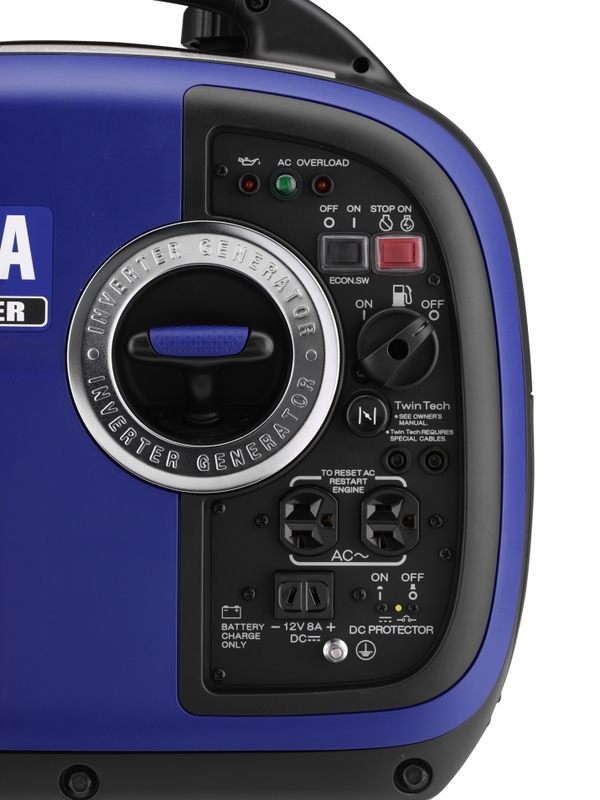 The Yamaha EF2000iSv2 Gas Powered Portable Generator is one of the most quiet inverter generators, besides it being smaller than other generators. It also offers wide range of applications than most generators. It is portable, has longer running time and you can power more devices! The Yamaha EF2000iSv2 Gas Powered Portable Generator improved the controller and added advanced programming to accommodate more devices but making sure it is still fuel efficient. The Smart Throttle will control the engine speed and will tell you the load needed to let you save fuel continuously. We have a short video about the Yamaha EF2000iSv2 where we give you the most important information you need to know before you buy. A high quality 79 cc 4-stroke overhead valve engine is being used by Yamaha EF2000iSv2. It has a cast iron cylinder to prolong and improve the engine and the life. Yamaha’s Pulse Width Modulation (PWM) control is installed on this inverter generator, it provides one of the best sine wave to run the any gadget or appliances. 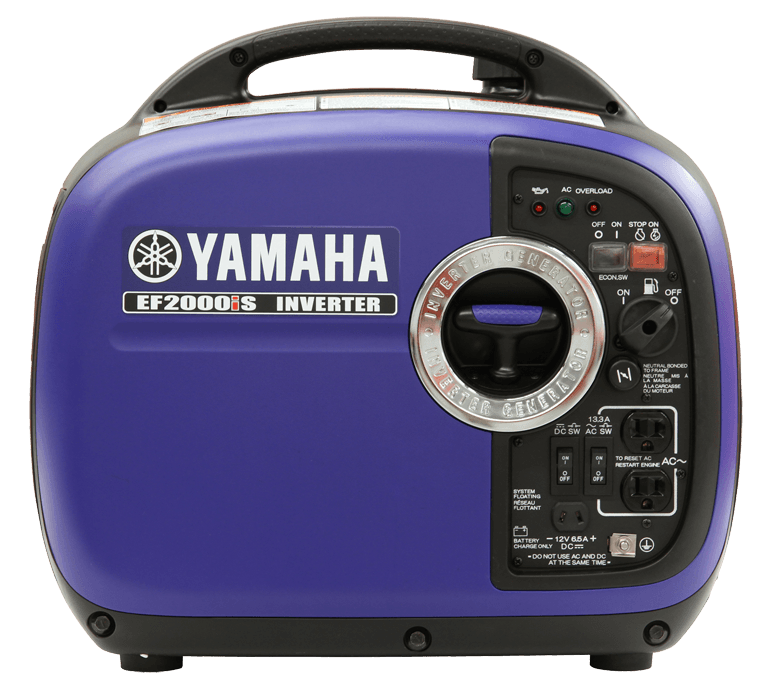 Yamaha EF2000iSv2 has 1,600 running watts, which means it may not be the best emergency power source but it can power a few number of appliances. This 45-pound inverter generator is quite lighter than the average generator weight. Because of its fuel efficiency, though it has only a 1.1 gallon gas tank, it can run for almost 11 hours with 25% load only without refueling. For the built-in outlets, there are two (2) alternating current or AC Outlets which is the most commonly needed to charge appliances, and has a direct current or a DC Outlet to charge batteries, too. Yamaha inverter generators are known to have the quietest system, like this EF2000iSv2 has only 51.5 dB to 61 dB. You won’t hear the generator is running until you are really close to it. This Yamaha EF2000iSv2 is one of the lightest and most compact generators ever! It weighs approximately 45 pounds and measures only 2.2 cubic ft. You can take this inverter generator anywhere and carry it during camping, or for emergency cases. Does not contain oil, basic tools and funnel. Warranty: Limited two-year warranty that covers the defects in parts, and services for three (3) years. Customer reviews from Amazon.com are just amazing! There are over 413 reviews on Amazon.com, which 77% of them awarded this unit 5 Stars. Overall, Amazon loyal buyers have rated this incredible Inverter generator a total of 4.3 out of 5 Stars! Before buying anything, always apply the needs versus wants balance so you . Just be sure you know your power needs. If the features and price combination match for you, you can’t go wrong. The fact that it remains a bestseller over the years shows that consumers are happy with this generator and are not afraid to tell others. Not only does it sell well, but the many users who don’t mind shelling out a good chunk of change for another one to use in tandem tells you something. I can confirm that the Yamaha EF2000iS is all that it’s cracked up to be. The defect rate is VERY low. It compares nicely to the gold standard. The similarly sized Honda inverter portable generator. If you want the features that this generator has, you will be happy with this one. For mid to small needs, this works fine. Remember it is upgradable by hooking up a second unit with the connection cord (separate purchase). Hooking two of these up will give you the ability to provide for most of your home’s power needs in an emergency to power multiple devices during a power outage, but I don’t recommend this. And they can of course be disconnected and used separately. Customers who have purchased the Yamaha EF2000iSv2 Generator say this machine holds up to the quality of its name. They love the fuel gauge on this unit so they are sure not to run out of fuel when its needed. It is a quiet machine that is a real bonus, especially when using in camp grounds, and appreciate how portable this model is and how easy it is to store. Another customer who purchased the Yamaha EF2000iSv2 Generator says it a little gem and couldn’t be happier with the power of this machine. It’s easy to start, runs great, and has been a life saver during their last power outage. This model was able to keep their furnace running, lights on, and made it possible to continue watching their favorite programs. They recommend this unit to everyone. There are 411 reviews on Amazon, and the majority of them give this model a 5 Star review. To be honest, there’s no real accessories which come included with Yamaha ef2000isv2. But with that being said, you don’t really need any accessories either as it’s simply a matter of fueling the unit, plugging in your appliance which requires power, and away you go! With auto warm up during startup at 2000 watts to be safe from big loads. The good thing about this unit’s inverter feature is it only produces safe, clean and reliable power that is refined. So even your small electronic gadgets that have high sensitivity to currents like cellphones, plasma TVs and laptops, these will be safe from surge damages. Used motor oil can cause skin irritations if left in long-tern contact with skin. Wash hands thoroughly with soap and water after handling oil. Do not dispose of used oil in drains or on soil. Local service shops provide environmentally-friendly disposal methods. Stop the engine and remove oil filler cap. Place a pan under the engine. Remove the oil drain screw and allow the oil to completely drain into the pan. Reinstall drain screw before filling the engine with fresh oil. Do not overfill oil reservoir. Use a funnel to prevent spillage. Turn OFF the engine. Let Cool. Turn the fuel valve ON. Position a container under the carburetor drain screw. Loosen the drain screw. Allow fuel to drain completely drain and re-tighten the drain screw. In our view, if you want a generator that you can use for camping or other recreational uses and, perhaps, support one or two larger appliances when emergency power is needed, the EF2000iS is one of the best and most reliable inverter generators you can buy. In particular, its fuel efficiency, quiet operation, and incredibly light weight make it a superior choice for those looking to travel with their power source. Moreover, from a quality and reliability standpoint too, Yamaha inverters are considered second to none, with the closest competitor being Honda. Nevertheless, we would definitely not consider this a good emergency power source for most people. 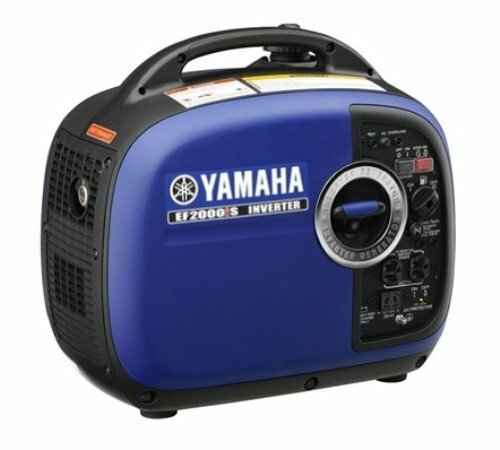 if you are buying a generator mostly for backup power to keep you going through outages, then most people with either need a much bigger Yamaha inverter, or a conventional generator that will deliver a lot more raw power for greedy appliances like sumps, fridges AC units, heaters, etc. Finally, even though the EF2000iS is very expensive compared to virtually all other generators, save the Honda models, we’d still consider it a good buy if you can afford it. The reason is that the EF2000iS is just so well-built and reliable – when you consider the many years of service it can provide, it’s definitely worth the relatively higher price tag in our view.